Chemical Guys Fresh Cherry Blast Scent smells just like fresh-picked cherries ready to be baked in a delicious pie. We've pressed the scent of these tangy little orbs into a refreshing air freshener that will surely make you smile. 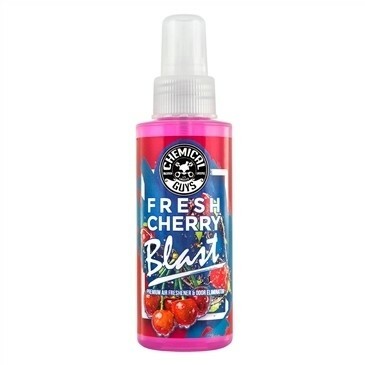 Cherry Blast Scent Premium Air Freshener and Odor Eliminator is a concentrated, long-lasting premium air freshener with natural enzymatic odor elimination properties. Cherry Blast does not just cover odors with strong perfumes; it actively eliminates odors and reduces recurring odors over time. Cherry Blast destroys odors at their source so they don’t come back. Use sparingly or dilute accordingly for superior air scents, and long lasting deodorizing ability. The gentle water-based formula mists into a fine aerosol to spread its delicious scent over a wide area with just one spray. Just two sprays purges stale french fry and musty upholstery smells from any car, truck, or SUV. Remove cooking smells and eliminate bathroom odors from inside RVs and campers. Take Fresh Blast Cherry Scent anywhere that needs to smell better, including the home, office, locker room, rec room, or even boutique shops and restaurants. Skip the trip down to the countryside orchards and save time baking countless pies just to enjoy the scent of delicious cherries: just mist two sprays of Chemical Guys Fresh Cherry Blast whenever you need it. There’s a reason people have always finished the sweetest treats with a cherry on top. What good is a sundae, banana split, milkshake, or fancy cocktail without the cherry? Chemical Guys Fresh Cherry Blast Air Freshener is the perfect choice for fans of delicious cherries. Real cherries taste tart and sweet when plucked fresh from the tree, they ooze with sugary sweetness when baked into a pie, and the black cherries blended into ice cream take the edge off a hot summer day with their velvety smoothness. Neon red maraschino cherries shake up cocktails like a fun prize at the bottom of the glass, and warm cherry pastries hit the spot with savory sweet goodness. What does the inside of your car smell like now? Probably like stale french fries and musty carpets. Don’t put up with old odors and scents any longer: spritz some Fresh Cherry Blast Air Freshener & Odor Eliminator around the cabin, and purge foul odors with the scent of cherries fresh-picked at the country orchard.